Wallace Quinn opened in 1990 and has offices in Glasgow and Livingston, with clients all over the central belt of Scotland (and a few beyond!). Wallace Quinn provide services in conveyancing, private client and commercial property. We may be a long-established firm, but we have a modern, contemporary attitude to our business. We’re embracing technology and innovative practices in our case management, client relations and business development. We believe approachable, clear and engaging client relations is key to our development and our continued success. We believe in giving our staff room to grow in their professional careers through training and support. One of our partner solicitors started at Wallace Quinn as an office junior. You’ll have experience of preparing wills, POA, Advanced Medical Directives and advising clients on succession planning, inheritance tax issues and care cost planning. You’ll probably have four or five years’ experience. You’ll be expected to generate business both externally and from our substantial existing client bank to ensure that those clients for whom we have provided other services are also given effective advice on estate planning, etc. You’ll be able to put in place protocols to ensure we regularly update and revisit our clients documents. The size of firm you’ve worked for is less important than your ability to handle a volume of work and still provide excellent, consistent client service. You’ll be flexible and able to work as part of a team. The successful applicant can expect a generous, competitive salary and great working benefits. We expect this to be a full time (35 hour) position, although we will consider part time, flexible working and (initially) home work if appropriate. 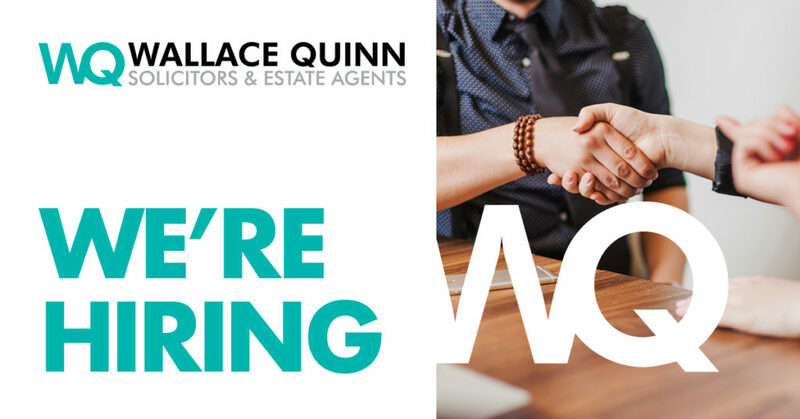 Wallace Quinn are committed to growing our Private Client base and the successful applicant will have the opportunity to grow along with us – in the future you may run a department within Wallace Quinn with additional staff. If you’d like to apply, email a CV and a covering letter to john@wallacequinn.co.uk telling us why you would be perfect for this job.